Babies grow up so fast, parents are always left wondering where did the time go?! It hardly takes a year for newborns to give up their feeding habits (which are hourly) and sleeping habits (which are rarely! ); and grow into a smiling toddler crawling around the house, learning and interacting with anything and everything. You, as a parent, would do well to cash upon this phase in a baby’s life, by introducing him/her to a whole new bunch of exciting as well as educational toys to grow & learn along with. 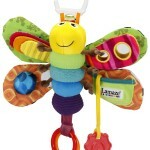 1 1) Lamaze Play and Grow Take Along Toy – Freddie the Firefly! 1) Lamaze Play and Grow Take Along Toy – Freddie the Firefly! This plush toy, from the well known brand Lamaze, is full of innovative features that will enhance your baby’s creative and imaginative skills and stimulate his/her senses, as well as keep him/her entertained. It is absolute fun and offers ample learning and exploration activities to help your little one grow. It features a little mirror designed for self-exploration and a lady-bug shaped teether to soothe your baby’s gums. It has a squeaker, and clacking rings which provide pleasant, comforting sounds to your baby for entertainment and nice comfort. There is a link attached to the toy’s head, so that your baby can “take it along” wherever he/she might wander off to. The Lamaze link can be attached to play mats, strollers or diaper bags to carry it along when you are out. This little rattler is aimed to serve as your baby’s first learning toy. The NogginStik Developmental Light-Up Rattle has been voted as one of the best toys for infants by many parents for its effectiveness and innovative features. 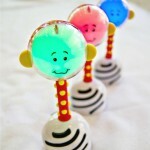 The NogginStik rattle’s head lights up with three different colours (red, blue, green) when shaken, which is helpful in stimulating your baby’s eyes and encourages visual distinction and tracking skills in him/her. The base of the rattle stick makes a soft rattling sound when shaken, which is pleasing to hear and keeps the baby engaged. The easy to hold handle encourages the grasping ability of your infant baby, and has vivid, soft textures to delight him/her with a new found touching and squeezing ability! 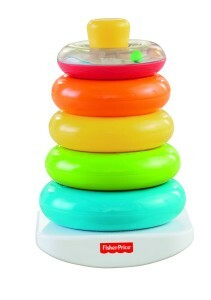 The Rock-a-Stack bears every hallmark of the Fischer-Price legacy, and remains a classical toy for infants and toddlers to play and grow along with. It has a minimal design and yet is full of ways in which a baby can play with it for hours! There are five colourful rings that are meant for younger babies to grasp, hold, shake, and explore. The smallest ring has a shiny surface with colourful, moving beads filled inside that make fun rattling sounds. When your baby is big enough to sit & stack, he/she can place rings on the post, then bat at the wobbly base to make it rock back and forth. Stacking helps your baby develop eye-hand coordination, and introduces him/her to the concept of relative size as they learn to sort and stack from biggest to smallest! One of the best-sellers for 2015, this Baby Einstein Take-Along Tunes is meant to introduce your little one to melodious classical music. It features a central toggle button, which when pressed plays 7 classical melodies, along with colourful dancing lights which flash on the screen for each song. 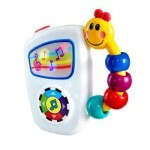 The child-friendly MP3 player has a caterpillar shaped bead-chaser handle which allows your baby to easily “take along” the classic tunes wherever he/she crawls off to, an on/off switch and Low-High-Mute volume control switch to control the settings. While it easily keeps the baby engrossed, the Baby Einstein Take-Along Tunes helps develop your baby’s auditory skills and instils a penchant for quality music from an early age! The Baby Einstein Gym comes equipped with so many features, that your baby will stay engrossed with it for hours on end. The soft activity gym features dancing lights, classic melodies and six activities for your little one to learn and grow with. For the essential tummy time, there is real life imagery drawn on the washable play-mat for your baby to busy him/herself with. The star-shaped toy can be attached to play gyms, cribs and carriers, and has baby motion-activated lights and eight classical melodies. It is also fitted with additional toys which include: a ring rattle, a Dog chime, , Frog shaped rattle with bead chase, discovery cards with real life imagery, leaf-shaped water-filled teether, and large baby-safe mirror. 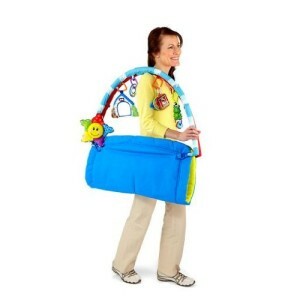 It is machine washable, folds easy for travel or storage and requires 3 AA -sized batteries. The Shakira Stack’n Learn Alphabet Blocks consist of 50 easy-to-stack, building blocks which encourage development of fine motor skills and eye-hand coordination in your baby. There are all the 26 letters from A-Z, along with very familiar objects painted on them which start with each of these letters. The square and circle shaped blocks are easy to grasp and build, which helps your baby to develop thinking and problem solving capabilities as he/she learns to balance and stack them up. 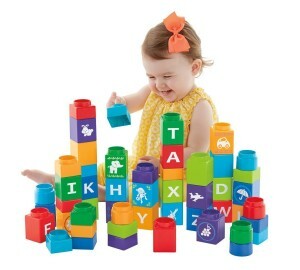 This toy will keep your baby engrossed with her building, while you can act as a smart parent and point out each letter he/she holds or stacks up, and say the name of the object pictured on it out loud to him/her. This will help her ability to associate letters with objects, and soon he/she will be able to say the letters and objects’ name on his/her own. The Fisher-Price Puppy & Friends Learning Table is designed to keep your baby engrossed with him/her little table, all the while learning and discovering new things. Since this is a table, it is of a very suitable height which will entice your crawling baby to stand up on his/her own and play with it. This learning table features four light-up corners and fun Sis, Puppy and Monkey characters for your child to interact with. The four corners actually have four different miniature versions of a piano, a laptop, a phone and a book to introduce your baby to these modern objects. 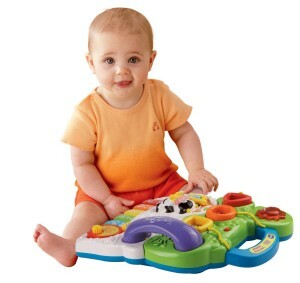 It has over 60 built-in songs, tunes and learning activities that teach your baby the first words, shapes, different colours, greetings, letters, numbers and counting, Spanish and more, while the pushable buttons, sliding mouse, pages to turn and levers to flip all aid in fine motor development. 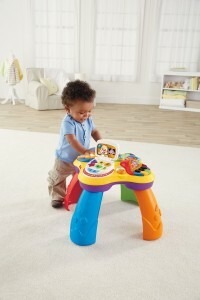 You can also detach the table’s legs and keep it on the floor for your little one to play with. 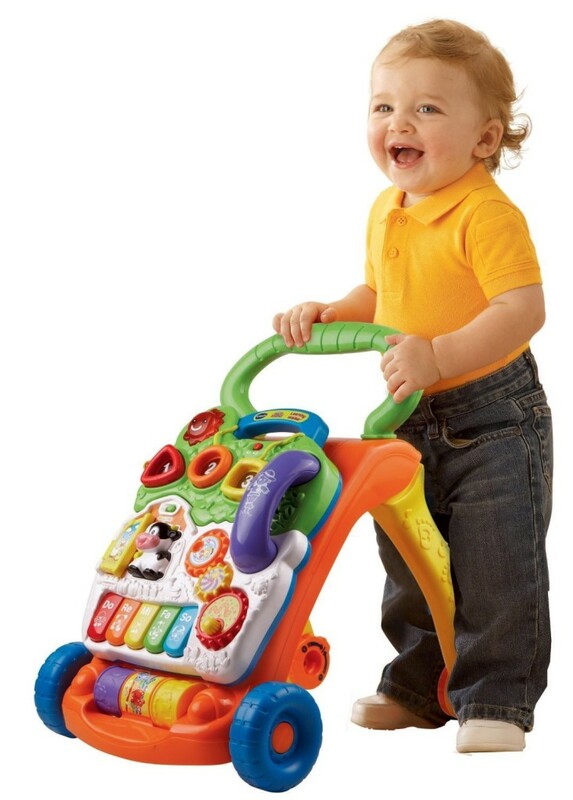 VTech’s Sit-to-Stand Learning Walker, as the name suggests, is an ideal learning toy for your baby to graduate from crawling to start walking! 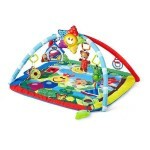 It comes fitted with a removable, interactive play panel which is actually a medley of fun things to do for your baby. The play panel has five piano keys, three spinning flowers, rollers, three light-up shape sorters AND a telephone handset! All these fun things actually have a meaningful purpose too, that to make your baby learn about shapes, colours, animals, music, sorting orders and develop his/her motor skills. The walker can be used to step up your baby’s manoeuvre to stand up on his/her own. Its adaptive, fun and attractive design will act as an incentive for the baby to try standing up and push the walker around by him/her self. 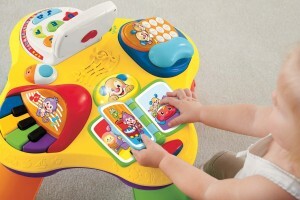 This electronic learning toy teaches toddlers letters, numbers, colors, songs, stories and more! 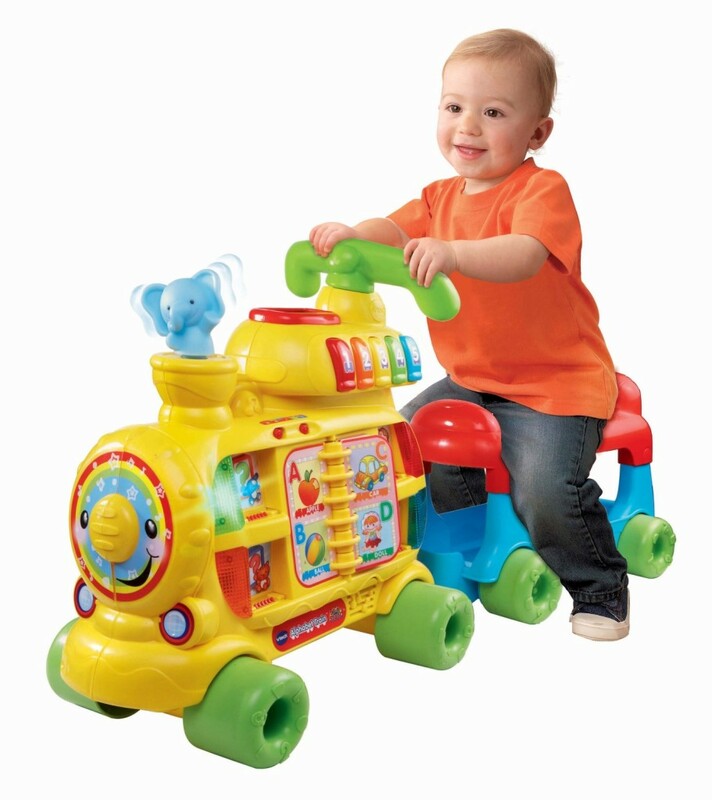 The Sit-to-Stand Alphabet Train features letter blocks, a book with turning pages, five colorful number buttons, one movable elephant character, a motion sensor, a ride-on carriage and a drop-space for sending the blocks from the train to the carriage. You can use it as a standalone toy for your baby to play on the floor, push along as a walker, or attach to the carriage as a ride-on toy! The book is fitted with six tear- and water-resistant, turning pages which will help your child get familiarized with important concepts while enhancing his/her motor skills. 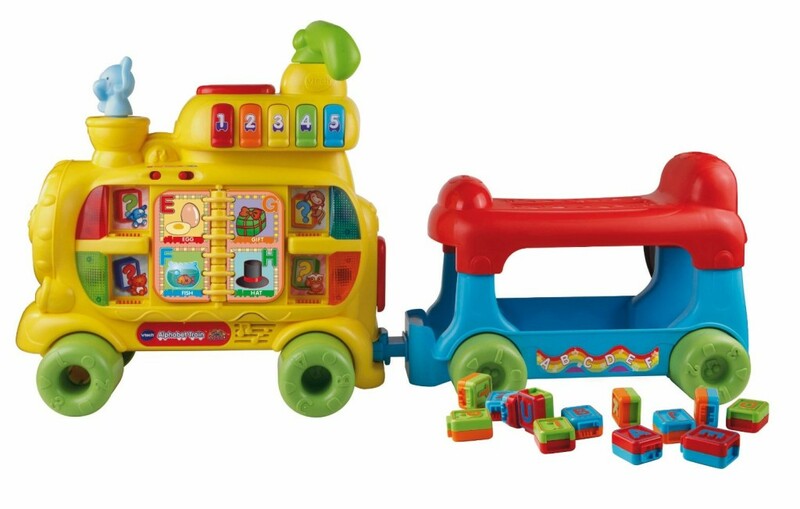 There are also over 100 sing-along songs, music, sound effects and fun phrases built into the toy to give your baby an enjoyable learning experience. Moving on to the “big” babies now, this one is aimed for kids who are already walking with that confident strut and want to follow you everywhere and in everything you do! 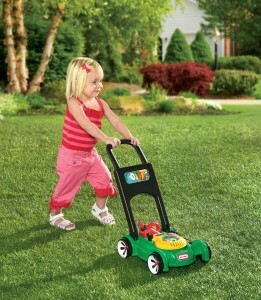 The Little Tikes Gas ‘n’ Go Mower allows your little ones to follow you out on the lawn when you are mowing the grass, with their own little mower. The Tikes Gas ‘n’ Go Mower has excellent, realistic features based on the design and features on real lawn mowers, which will keep your baby entertained for hours. 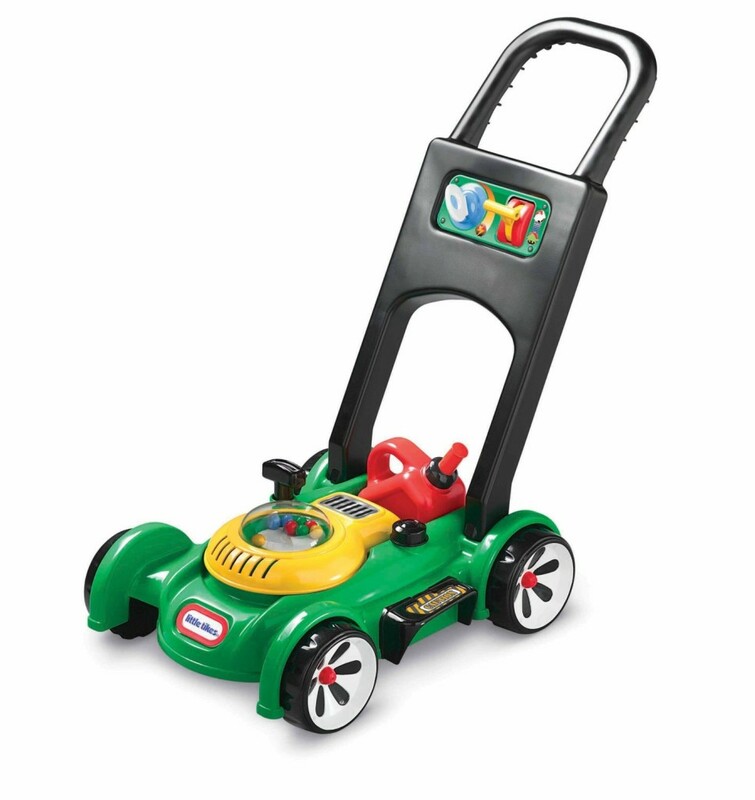 Whether he/she is out “actually” mowing with you, or just pretending to mow the green around his/her playhouse or carpet, your child gets to encourage his/her imaginative and creative abilities with this cute, little mower. The best part about this mower is that it is completely mechanical, and does not require any batteries to be run (though there IS a pretend little gas can, which your baby needs to “refill” time to time) . What’s more, the engine is started by pulling a cord which produces a nice, clacking sound as if the mower was actually being powered on!